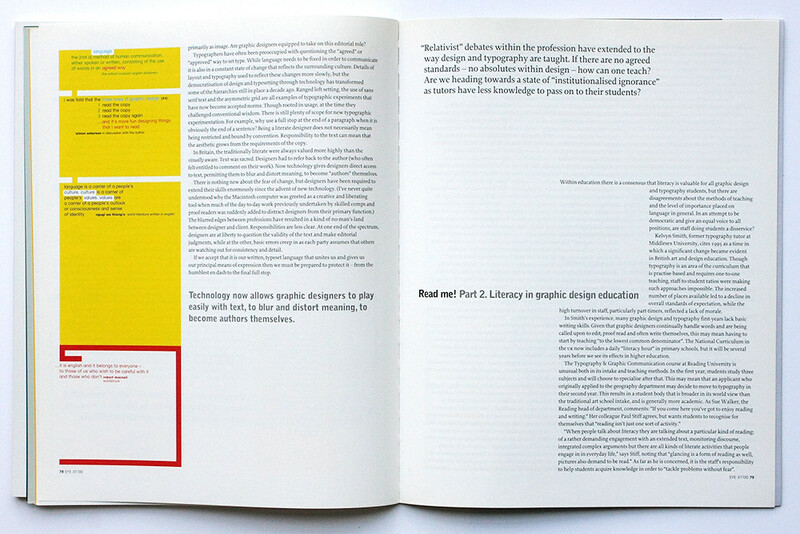 ‘Relativist’ debates within the profession have extended to the way design and typography are taught. If there are no agreed standards – no absolutes within design – how can one teach? Are we heading towards a state of ‘institutional ignorance’ as tutors have less knowledge to pass on to their students? 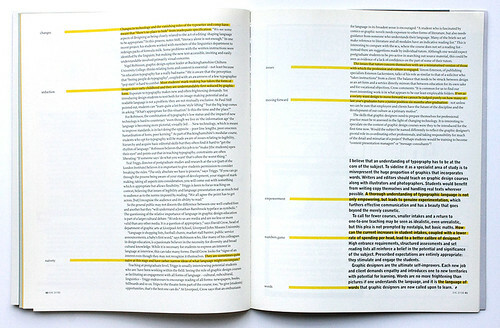 Within education there is a consensus that literacy is valuable for all graphic design and typography students, but there are disagreements about the methods of teaching and the level of importance placed on language in general. In an attempt to be democratic and give an equal voice to all positions, are staff doing students a disservice? Kelvyn Smith, former typography tutor at Middlesex University, cites 1995 as a time in which a signiﬁcant change became evident in British art and design education. Though typography is an area of the curriculum that is practise-based and requires one-to-one teaching, staff-to-student ratios were making such approaches impossible. The increased number of places available led to a decline in overall standards of expectation, while the high turnover in staff, particularly part-timers, reﬂected a lack of morale. In Smith’s experience, many graphic design and typography ﬁrst-years lack basic writing skills. Given that graphic designers continually handle words and are being called upon to edit, proof-read and often write themselves, this may mean having to start by teaching ‘to the lowest common denominator’. The National Curriculum in the UK now includes a daily ‘literacy hour’ in primary schools, but it will be several years before we see its effects in higher education. 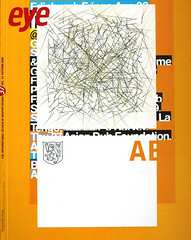 ‘When people talk about literacy they are talking about a particular kind of reading; of a rather demanding engagement with an extended text, monitoring discourse, integrated complex arguments but there are all kinds of literate activities that people engage in in everyday life,’ says Stiff, noting that ‘glancing is a form of reading as well, pictures also demand to be read.’ As far as he is concerned, it is the staff’s responsibility to help students acquire knowledge in order to ‘tackle problems without fear’. Changes in technology and the vanishing roles of the typesetter and comp have meant that ‘there’s no place to hide’ from inadequate speciﬁcation. ‘We see some aspects of designing as being closely related to the act of editing: shaping language to be appropriate.’ In this process, notes Stiff, ‘literacy alone is not enough.’ In one recent project, his students worked with members of the linguistics department to redesign packs of formula milk. Some problems with the written instructions were identiﬁed by the linguists, but making the new text accessible, inviting and easily understandable involved primarily visual concerns. So the general public may not discern the difference between one well crafted font and another but they ‘will understand a Jonathan Barnbrook typeface as symbolic.’ The questioning of the relative importance of language in graphic design education is part of a larger cultural debate. ‘Words to us are media and are no less or more valid than any other media. It is a question of appropriacy,’ says David Crow, head of department of graphic arts at Liverpool Art School, Liverpool John Moores University. Teaching at postgraduate level, Triggs is usually interviewing potential students who are/ have been working within the ﬁeld. Seeing the role of graphic design courses as facilitating an engagement with all forms of language – cultural, subcultural, linguistics – Triggs endeavours to encourage reading of all forms: newspapers, books, billboards and so on. Trips to the theatre form part of the course, too, ‘to give [students] opportunities, that’s the best one can do.’ At Liverpool, Crow says that an enthusiasm for language in its broadest sense is encouraged: ‘A student who is fascinated by comics or graphic novels needs exposure to other forms of literature, but also needs guidance from someone who understands their language. Many of the briefs we set make reference to literature and all modules have an indicative reading list.’ This is interesting to compare with the RCA, where the course does not set a reading list – instead there are suggestions made by individual tutors. Although one would expect postgraduate students to be pro-active in searching out source material, this could be seen as evidence of a lack of conﬁdence on the part of some of their tutors. The issues that tutors concern themselves with are a miniaturised version of those with which the profession and culture is engaged. Simon Esterson, of publishing specialists Esterson Lackersteen, talks of his role as similar to that of a solicitor who ‘takes instructions’ from a client. The balance that needs to be struck between design as an art form and a service directly mirrors that between education for its own sake and for vocational objectives. Crow comments: ‘It is common for us to ﬁnd our most interesting work is in what appears to be our least employable folders. If we as a society want design to move forward we cannot be judged purely on how many of last year’s graduates have a junior position six months after graduation – not unless we can be sure that employers and clients have the future of the discipline and the development of our culture as a primary motive’. The skills that graphic designers need to prepare themselves for professional practice must be re-assessed in the light of changing technology. It is interesting to speculate on the content of graphic design courses were they to be introduced for the ﬁrst time now. Would the subject be named differently to reﬂect the graphic designer’s pivotal role in co-ordinating other professionals, and taking responsibility for much of the detail and minutiae of a project? Perhaps students would be training to become ‘content presentation managers’ or ‘message consultants’? I believe that an understanding of typography has to be at the core of the subject. To sideline it as a specialist area of study is to misrepresent the huge proportion of graphics that incorporates words. Writers and editors should teach on graphic design courses along with illustrators and photographers. Students would benefit from writing copy themselves and handling real texts wherever possible. A thorough understanding of typographic language is not only empowering, but leads to genuine experimentation, which furthers effective communication and has a beauty that goes beyond the merely cosmetic. To call for fewer courses, smaller intakes and a return to one-to-one teaching may be seen as idealistic, even unrealistic, but this plea is not prompted by nostalgia, but basic maths. How can the current increases in student intakes, coupled with a lower rate of spending per head, lead to a better calibre of designer? High entrance requirements, structured assessments and set reading lists all reinforce a belief in the potential and significance of the subject. Prescribed expectations are entirely appropriate: they stimulate and engage the students. Graphic designers are the ultimate self-improvers. Each new job and client demands empathy and introduces one to new territories with potential for learning. Words are no more frightening than pictures if one understands the language, and it is the language of words that graphic designers are now called upon to learn. … and it’s more fun designing things that I want to read’, Simon Esterson in discussion with the author.